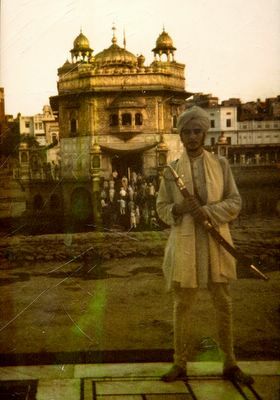 In June of 1973, the Siri Singh Sahib appointed Singh Sahib Dayal Singh as Head Granthee for Sikh Dharma and bestowed upon him the title of Bhai Sahib. Bhai Sahib Dayal Singh was only 17 years old at the time but he had a fervent love for the Guru and Gurbani. He was a constant sevadar, mowing lawns, cooking langar, sweeping the Gurdwara steps, placing fresh cut flowers in front of the Guru. Always full of love, smiles, and constant encouragement for everyone. With his incredible devotion he was one of the first persons to teach many Western Sikhs how to read Gurmukhi, how to recite their Banis, and how to do Prakash and Sukhasn seva and conduct a kirtan program. On Baisakhi Day, April 13, 1974 Sant Mihen Singh and his followers, while visiting Los Angeles, distributed Amrit to Western born Sikhs at Guru Ram Das Ashram and Bhai Sahib Dayal Singh served as one of the Panj Piare on that day, thus becoming the first Western born Sikh ever to administer Amrit. An Amrit Sanchar was held every year thereafter on Baisakhi in Los Angeles. It was a great loss to the Panth Khalsa when Bhai Sahib Dayal Singh left for the heavenly abode resulting from a fatal car accident on September 22nd, 1975, just short of his 21st birthday, en route to New York, where he was to depart for India and a visit to the Golden Temple. Bhai Sahib Dayal Singh passed away before I was born, but my mataji knew him and spoke very well of him to me. It is so amazing what our parents and the Siri Singh Sahib and all the early people in 3HO did for us. They started us on the path of Dharma. They came from so many walks of life, with so many perspectives and challenges and lifestyles and they all bowed to the Siri Guru Granth Sahib. It is the individual karma of the soul that will take us each on a journey towards God. My karma led me to this beautiful Dharma. The Guru’s grace is so perfect, even uttering one word of Gurbani is like the highest gift that one could receive in this human life. The Guru gave more though, we each have the opportunity to be recognized as the children of the Guru. Four sons were sacrificed and today there are thousands recognized as the sons and daughters of Guru Gobind Singh. The Khalsa family belongs to God. God is one and at the same time many. The beautiful and manifold diversity of God’s creation is also manifest in the Khalsa family. Not one Khalsa is exactly alike and yet we all bow to the one and only Siri Guru Granth Sahib. This is our strength and this is our inspiration. God is the unity in all diversity. God has been revealed to us in everything. Thank you Guru Ji for blessing each of us. I pray that we may live up to your teaching to recognize all humanity as one. beautiful, heart-warming words of positive attitude and lively affirmation. The unity comes from imbibing the spirit of Gurbani which is the most authentic source of divinity we have with us. When we have such a majestic, awe-inspiring, pristine fountainhead to fulfill our spiritual quest – why go to the muddy, polluted, fake, mythological waters of nearby canals and ponds? I’m like a worm/insect who seeks Satguru’s refuge – have compassion and illuminate me with naam. See how beautiful it is. No rhetoric, no arguments, no tricks, no miracles, no shortcuts, no rivalry, no competition, no hierarchy, no promise, no expectation – an earnest prayer, a simple request for sanctuary and illumination. BTW, I llke your website. Keep up the good work. It’s become part of my routine sadhana, now. Washing the marble floors on Sunday mornings at the Hacienda de Guru Ram Das ashram, Espanola, in the state of New Mexico, USA. The highlight of my week, I call it. The funny thing is â€“ each time I go, there’s another lesson to learn â€“ another message from the Guru revealed through the ordinary, the mundane. A few Sundays ago, for instance, a woman arrived at our Gurdwara at 3 am. She wore a pink top, black flare pants and a stylish pink scarf tied around her head. For anonymity’s sake, I’ll call her Marge. She has a nice smile and willing hands. We give her a hug, welcome her and after reciting Japji (during which she sits and quietly listens), we hand her the vacuum cleaner and she starts with the rugs. The morning seva goes by slowly. Some of the regular sevadars are out of town this week, so we are, all of us, taking extra time to learn to perform a task we’ve never done before. In the months since I’ve started coming to this beautiful morning seva, I have learned a tremendous amount about how to take care of the Gurdwara and the Guru: how to dress the Manji Sahib with Roomalas; the proper way to put the Guru in Sukhasan; how to treat the swords with respect. Washing the floors is the play around which an entire schooling happens. There’s so much wisdom about how to care for and protect the Guru captured in the simplest acts. And that wisdom is handed down practically, simply and lovingly by the head sevadars who have waited their whole life to be able to do this. Especially the women â€“ Sikhs of the Guru â€“ who have visited the Golden Temple, but never had the opportunity to serve the Guru this way. After Marge vacuums the rugs, she helps dust the marble floors. A dozen of us with feather brooms brush the dirt towards the center, and as the dust pile gathers, the head sevadar brings out a box of small plastic baggies. We count the number of people and gather the dust into an equal number of baggies, handing them out to everyone. I bring a little baggie with a little bit of dust over to Marge. “This is for you to take home if you like.” She looks at the gift skeptically, then looks back at me. Resisting a smile, she struggles between laughing and being polite. The way a visitor to a foreign country is polite when offered something unusual. “Is there someâ€¦significance to thisâ€¦that I would want to take it with me?” she asks with a slight anthropologist’s tone to her voice. Doing her best to understand the customs of the natives. It’s an odd moment. She and I are from similar backgrounds. We’ve grown up in the same country. And by her looks, I would say weâ€™re about the same age. But standing there in my turban, no make-up, wearing a very nice dress that’s about to get soaked from washing the floors, holding a little bag in my hand withâ€¦wellâ€¦let’s face itâ€¦a spoonful of dirt in itâ€¦all of a sudden, she and I are standing on two different planets. I feel this enormous gulf between us and wonder how to bridge it. I’m not making any sense to her. I can see it in her eyes, and for a moment, I look at that bag the way she is seeing it. There’s some dirt, a staple, a hairball, a little bit of stray plaster from the remodeling we’re doing inside of our Gurdwara offices. Not the most visually appealing gift in the world. It certainly doesnâ€™t look sacred. But then I look at it with my eyes and wonder how I can possibly explain to her what I see. Because I donâ€™t see the dirt and the staple and the plaster. I see all the people who have woken up at 3:30 am this week and brought themselves to this place, sat on these floors and worked on themselves. Sadhana is not a beautiful thing. It’s the time of day when you take an honest look at yourself, at your negativity, at your bad habits, at your painful past – and your soul decides to transform the negativity into positivity, the bad habits into commitments to do it different next time, the painful past into gratitude for the opportunity to heal from it. And yes â€“ it is dirt. It is unpleasant. And isnâ€™t that the irony of it, the joy of it? That somehow, in community, as the bonds of love and respect grow and deepen, that love changes what you see. You stop seeing all the flaws, all the faults in others. And you start to see how hard everyone works on themselves to keep up, to keep going, to connect with Spirit in an age where Spirit can hardly be found at all. So the dirt is no longer something repulsive or ordinary. It is something beloved. Beloved that, no matter how many times we wash these floors, there will always be more dirt tomorrow. And no matter how many times we meditate in the Amrit Veyla, there will be something in our subconscious to clean tomorrow. And in that heaven and earth connection is a profound lesson that what is most valuable in human life is a loving discipline to continually purify yourself, and being with people who practice that discipline, who can support you in practicing it, yourself. Guru Nanak knew it, ever longing for the blessing of the dust of the saint’s feet. What can I say to her? How can I show her my world in a grain of sand? She smiles then, with warmth and amusement. She’s not sure whether or not to believe me. But I know the secret part of her that longs for genuine ritual and connection to the Divine will go back to her home and one warm spring day, when no one is paying attention, she will take that dust in her fingers and sprinkle it on her land – awkward, feeling a little ridiculous, yet smiling from the memory of where and when she got it. And for a moment, she will do something that the culture I came from and the culture she still lives in would never allow. She’ll bless herself and bless the earth. Now, I know that the dust of the saints’ feet is something magic and I know, in that moment, something unexpected and surprising will begin in her life. As it once began in mine. We’ll see what Guru brings. Biggest Jewel in the crown and best flower! Could not be said any better than Siri Singh Sahib said. Thank you Gurumustuk for posting about Bhai Dyal Singh and informing us of this great soul. As I read Prabhu Singh’s comments, I am just amazed as to how beautiful, and clear understanding of Sikhi and Khalsa spirit he has in his mind. Very inspiring too. I wish every Sikh had this much love and level of understanding of the Guru and the Khalsa. Thanks Prabhu. Sometimes in daily life of things, we tend to forget the beauty of Sikhi and real spirit of Khalsa. just like a herd of sheep.